In this exhibition, Transmissions, Northwest artist Sherrie Wolf references both grand landscapes such as the American Hudson River School, as well as allegorical figurative paintings by Rubens, Rembrandt and Caravaggio. Wolf plays with illusion by combining contemporary still lifes with elements of paintings from art history, a technique that connects her work to the traditions of reinterpretation and artistic borrowing. In this show, she actively guides the viewer’s eye and interpretation through the use of reflection and refraction in glass vases or polished metal platters, focusing attention on and transmitting concentrated aspects of her reference images. 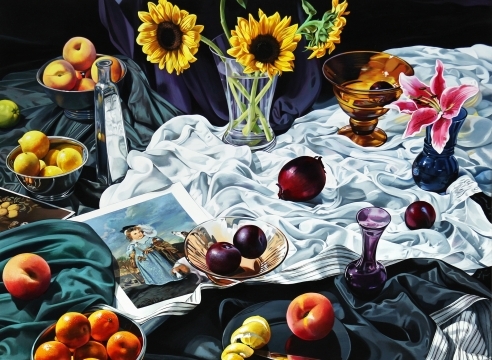 In many of these paintings, Wolf limits her use of fruit and flower still lifes, and begins to break the boundary between foreground and background to intimately explore the visual and thematic drama of her historical references, using her contemporary experience to present historical allegories in new ways. Sherrie Wolf graduated from the Museum Art School, now the Pacific Northwest College of Art, Portland, OR, in 1974 and received an MA from the Chelsea College of Art in London, England in 1975. She began exhibiting her work in the mid 1970s while teaching art at PNCA. Her work is included in such collections as The Vivian and Gordon Gilkey Center for Graphic Arts, Portland Art Museum; Hallie Ford Museum, Salem, OR; the Tacoma Art Museum, Washington; City of Seattle; and Washington State Art Collection. In 2010, her work was included in “The Secret Language of Animals,” at the Tacoma Art Museum, WA, and in “Album: Artist Portraits of Artists,” the 30th anniversary exhibition of The Art Gym at Marylhurst University, OR. Most recently, Wolf was selected as a finalist for the Portland Art Museum’s 2011 Contemporary Northwest Art Awards.